Corporations and institutional investors face new risks and challenges relating to water. Uninterrupted access to reliable, affordable and clean water is now a critical issue for the investment and corporate communities because of the increasingly significant effects that water-resource availability and quality are having on economic growth and activity, paths to development and markets around the world. In recent years, multinational corporations have had to close major factories or change operations because of scarce water resources, community action, water-quality concerns and disputes over demand for water. At the same time, poor, high-risk investments have been pursued, while key investment opportunities have been overlooked. REMAINING DROPS Freshwater resources: A global issue outlines key trends in water use and availability, describes new water-related risks and identifies strategies the financial community can take to assess investment opportunities and dangers and to reduce the risks they face. Understanding these issues is vital if investors, companies and policymakers are to successfully address the growing business, social and environmental risks posed by water problems. 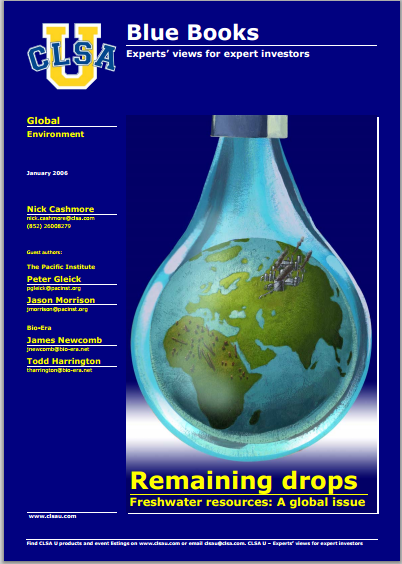 “REMAINING DROPS Freshwater resources: A global issue” was co-written by Peter Gleick and Jason Morrison of the Pacific Institute, and James Newcomb and Todd Harrington of Bio-Era for CLSA U.
the intersection of development, environment, and security. Bio Economic Research Associates (Bio-Era) is a leading provider of independent research and advisory services on the emerging bio economy. Bio-Eras mission is to help decision-makers understand and respond to the economic risks and opportunities arising from human-induced changes to biological systems. The firms practice areas include biosecurity, bioenergy and biotechnology. For more information, visit www.bio-era.net. CLSA U is a value-added executive education programme created to allow you to gain firsthand information and draw your own conclusions and make better informed investment decisions. Learn more at www.clsau.com.